On Wednesday the House of Representatives in a rare show of bi-partisan support overwhelmingly voted to make it easier for the Director of Veterans Affairs to fire senior Veterans Affairs officials. The House passed the VA Management Accountability Act, H.R. 4031, 390-33 with all “no” votes coming from Democrats. The main provision of the four page bill states, the Secretary may remove any individual from the Senior Executive Service if the Secretary determines the performance of the individual warrants such removal. The recently passed bill was in response to the scandal at the Veterans Administration, where veterans had long wait times at various VA health clinics across the country contributing to the deaths of 40 veterans. 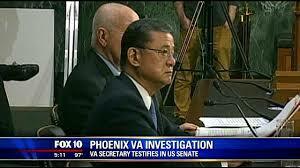 The controversy was compounded by the fact the VA knew about the problems for years but covered up the problem. After the bill passed the House it was sent to the Senate where it was stalled by Senate Democrats. Sen. Marco Rubio (R-Fla.), passionately spoke on the Senate floor in the urgent need to pass this bill. Sen. Bernie Sanders (I-Vt.) rejected at the pace of the passage of this bill before we had the chance to have hearing s on this piece of legislation. “Some of us are old-fashioned enough to know that maybe folks in the Senate might want to know what is in the bill before we voted on it,” he said. Its ironic Sanders made this argument that we should fully understand the full implication of what is in the legislation, when the bill is only four pages. The Affordable Care Act and its over 2,000 pages passed without many members of Congress having read the content and its impact which we are now seeing. Rep. David Scott (D-Ga.) in an emotional House floor speech was outraged at the response by the president and his lack of urgency regarding veteran’s receiving health care at the VA.
Scott was speaking in support of the bill making it easier to fire VA officials, but stated the first place to begin is with VA Secretary Eric Shinseki. The president needs to get in front of this or this will consume him and his administration.